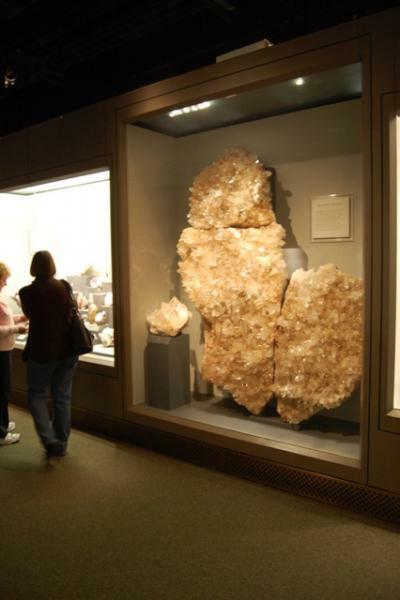 This Friday I will be in DC and have blocked off some time to go see the mineral collection at the Smithsonian. 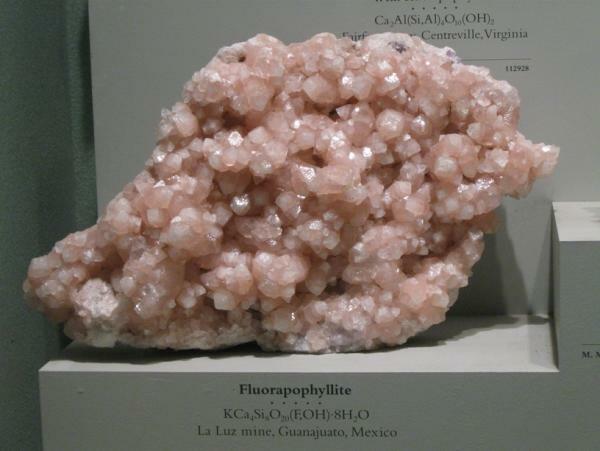 I thought about asking for recommendations on what to look at, but given that everyone appreciates different things about minerals, decided that a more interesting/useful question would be what pieces other recent visitors enjoyed seeing the most, so that I can keep an eye out for them...? 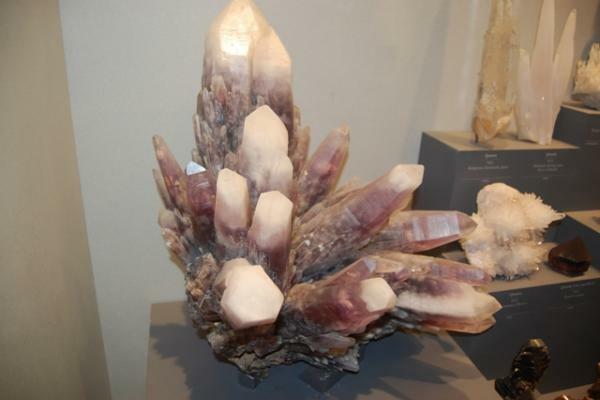 I love the giant Quartz/Amethyst spray that is from Mexico, you cannot miss it! 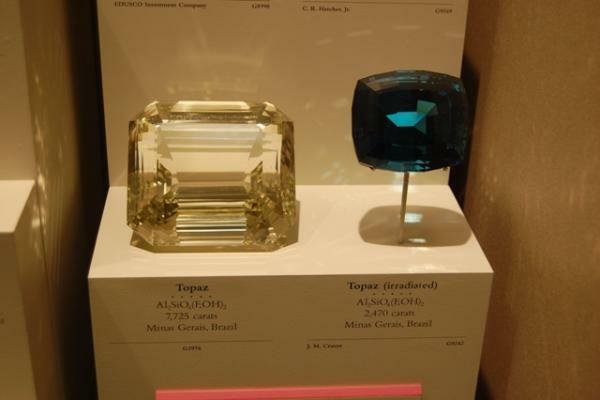 I also thought the beryls were spectacular as are the Blue cap tourmalines. I took over 600 photos while there in February. Why you don't share with us your, for example, 20 favorites, and place their photos here? On that way Tracy (and others) will get some guide for her visit. Okay, will resize the photos and send them to this thread today! 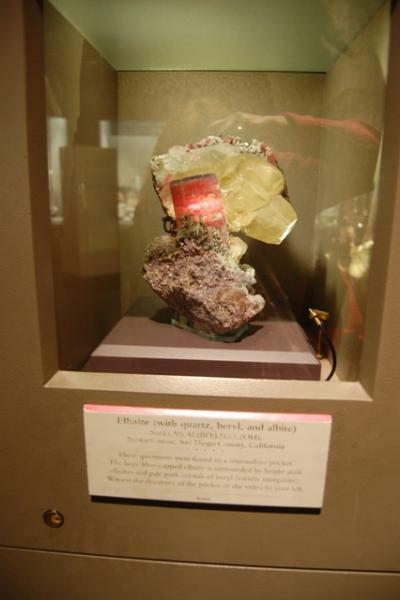 I would bypass the gem and gem crystal room and head directly to the mineral gallery. 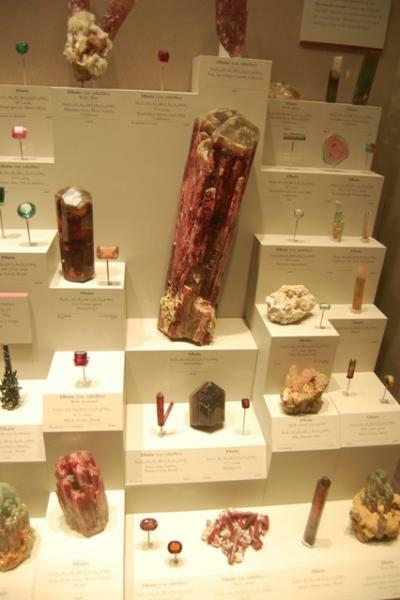 The gem room is spectacular but that is usually where all of the people are and if you are constrained by time, go for the minerals. I tend to look for the Arizona specimens but I always look at everything. The variety is tremendous and I would just start at one end and work towards the other end. I have been four or five times since the new gallery opened and see something new every time. Have fun and I may see you on June 15th. Great suggestions, thanks all. Any last-minute others? I have an all-day meeting tomorrow then Friday it's off to the museum...I will try to get photos of my favorites to publish afterward (also I have new photos to post in my own thread, just waiting for some free time). 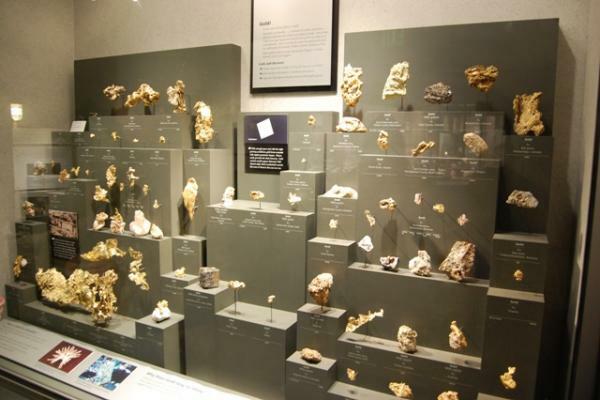 The mineral collection is incredible, and the hall is very well laid out. We started at the main entrance to the hall, where the spectacular Hope diamond is kept. 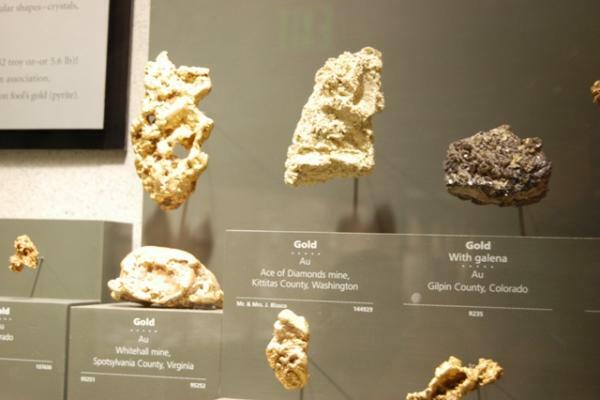 From there we moved to a room with geology displays, then on into the main exhibit of minerals (with a part dedicated to mining). 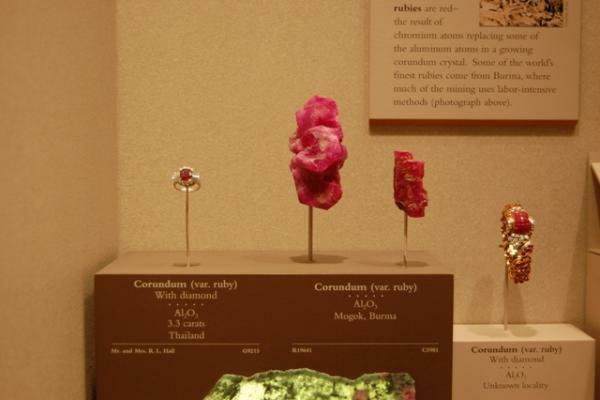 Last we went saw the gem/jewelry collection. All in all a terrific flow. 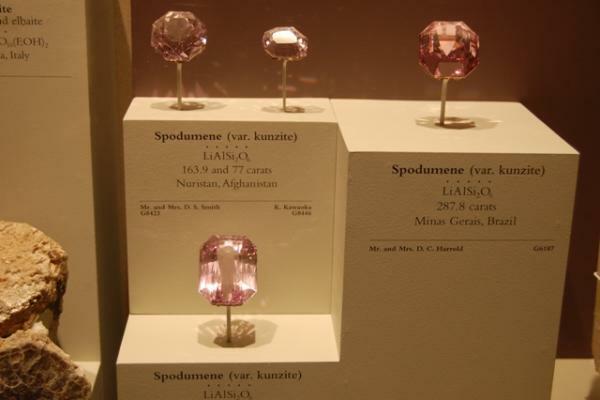 The gem/jewelry area was very crowded and it would have taken too much time to wait in line to see the pieces, so we spent most of our time looking at the mineral displays. 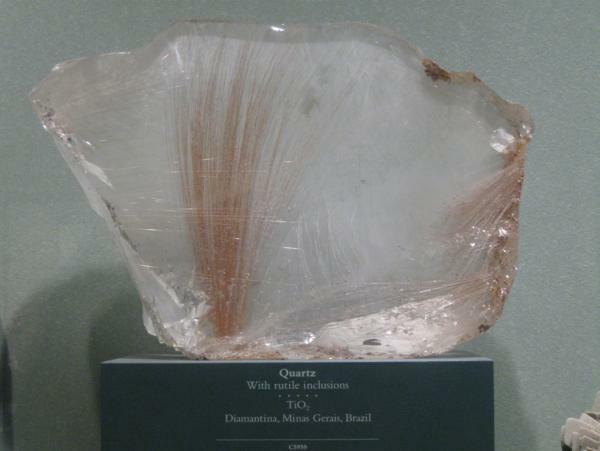 There were beautiful specimens everywhere – some out in the open for people to touch, some in cases arranged by theme (e.g., colors, mineral species/families, special localities, and a neat display of “rough” mineral specimens side-by-side with beautiful gemstones that are cut from them). There was much to see, and much to admire. 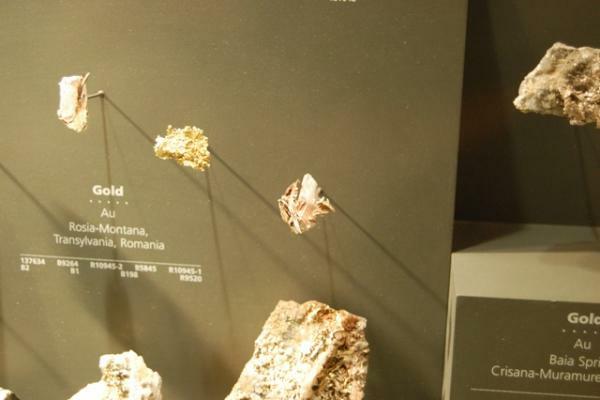 We were also lucky to have had a great “behind-the-scenes” tour from Paul Pohwat, the Collection Manager. It gave us some appreciation of the exhibit’s history, and of all the work that goes into assembling and maintaining such a great collection. 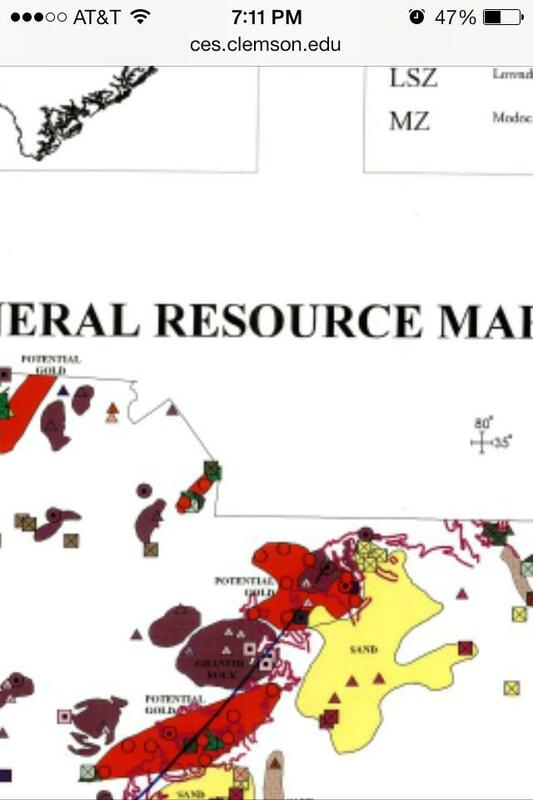 Here are some photos of things that caught my attention (over 2 postings). They are just a sampling of the great things we saw. 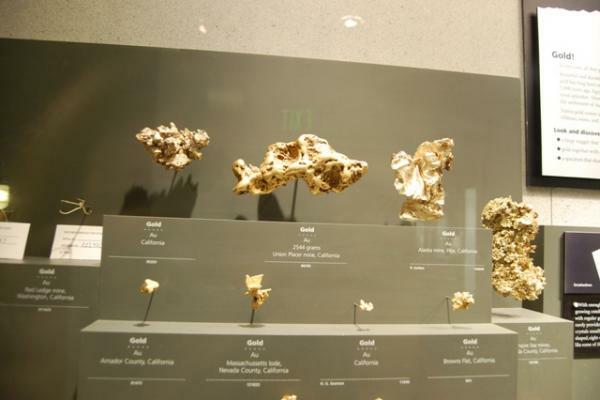 They are also some of the larger specimens because they were the most noticeable. I must comment: this was my first trip to the exhibit, but it is not going to be my last. There’s simply too much to see and take in at one time, and we only had one afternoon to spend there. I’m sure that the next time I visit I will find many more things to admire. 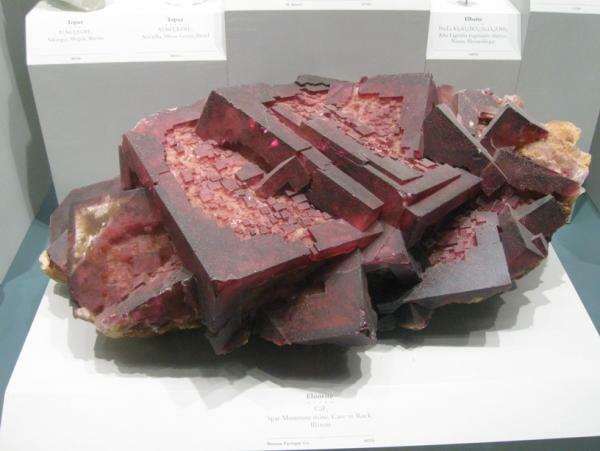 Also, I tend to favor minerals with great crystals and form – I’m sure that others who have been there recently would be drawn to other specimens than the ones I liked. Anybody else who wants to share photos of their favorites from this exhibit? 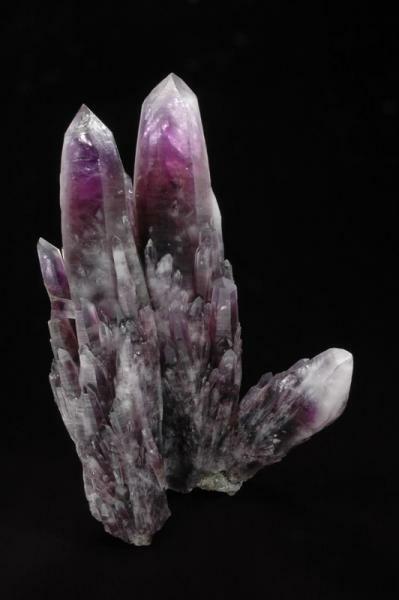 I missed the amethyst that Gail liked so much…please post a photo, Gail, along with any others you wish to add. 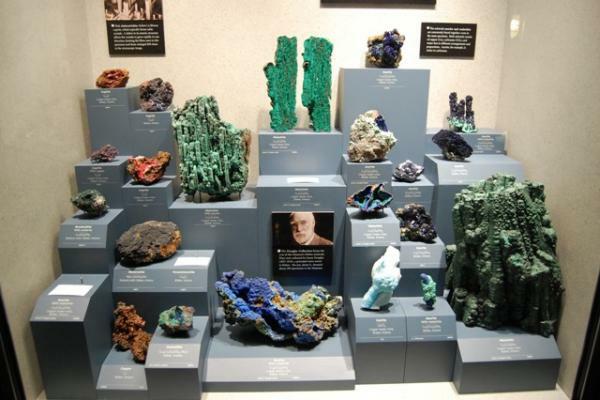 Lumping all of the stories I promised to tell together in one posting: in addition to visiting the Smithsonian, I had the pleasure of meeting John S. White the following day and seeing his collection. John is a terrific person, his specimens are fascinating and we really enjoyed spending the day with him and Merle. I hope to have another chance to spend time with you John, because in addition to having so much fun in your company, I know that there is so much that I could learn from you. Finally, the next weekend I was honored to have Les Presmyk visit me at my home. My collection is not well organized yet, and I don’t have proper display cases, but we had a lovely chat and I showed him some of my individual pieces as best I could. Les, I hope that you enjoyed what you saw. I was delighted to spend the day with you too. I estimate that you saw about 60% of my collection and perhaps you will come back to see the rest. 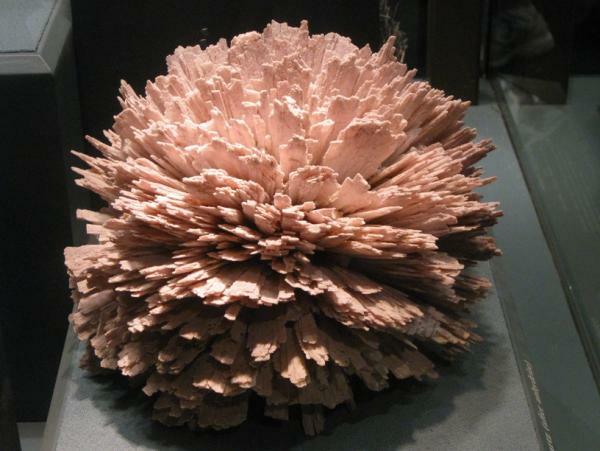 So, all in all June was a very special month for me and minerals. 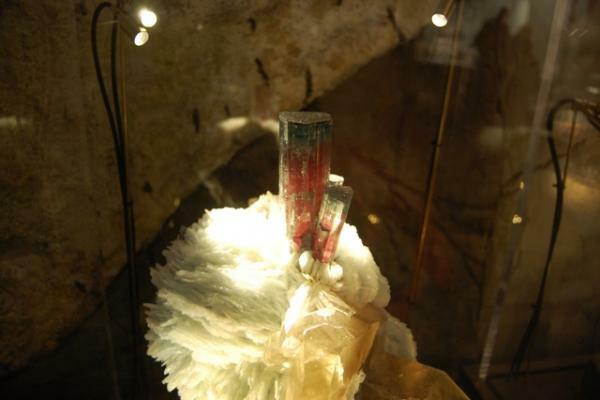 I realized the value of meeting other minerals people and seeing other minerals collection. 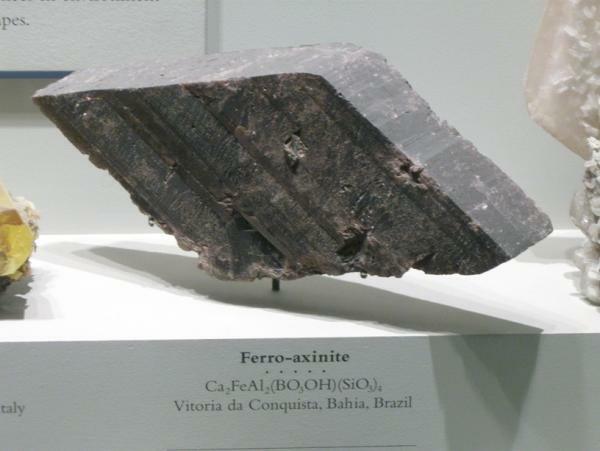 To that end, I am including a photo of me, so that if I do manage to get to a minerals show you will be able to recognize me! That is the end of my “report.” Congratulations to Spain on Nadal’s victory at Wimbeldon. Your country is having a terrific summer of sports! 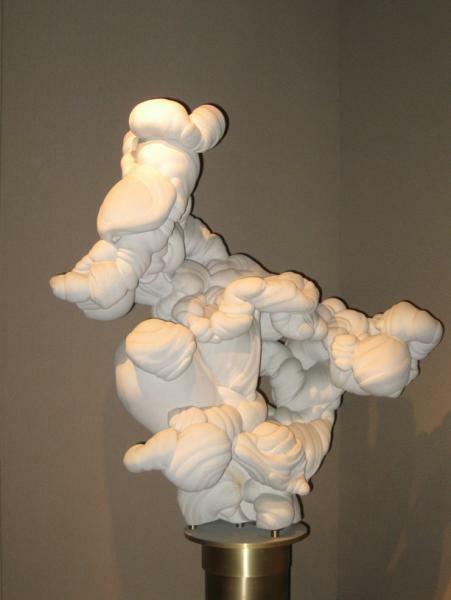 This sculptural sandstone concretion is off to the side near the Hope diamond. 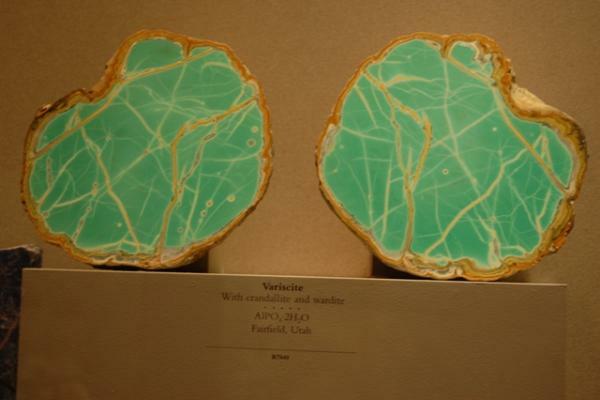 An interesting counterpoint to the gemstone, and a neat piece too! Plate of Oklahoma calcites. 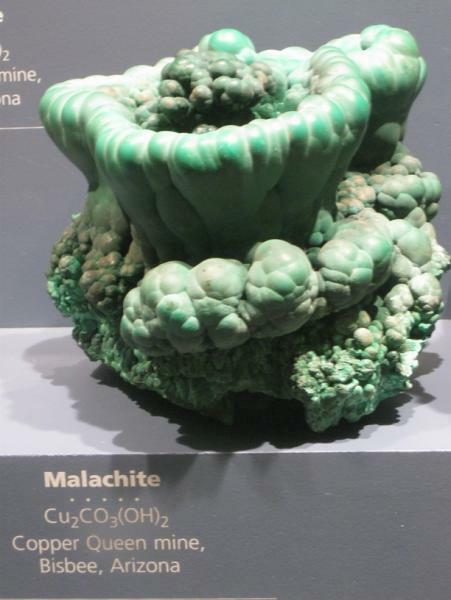 This has been on exhibit for 100 years or more. 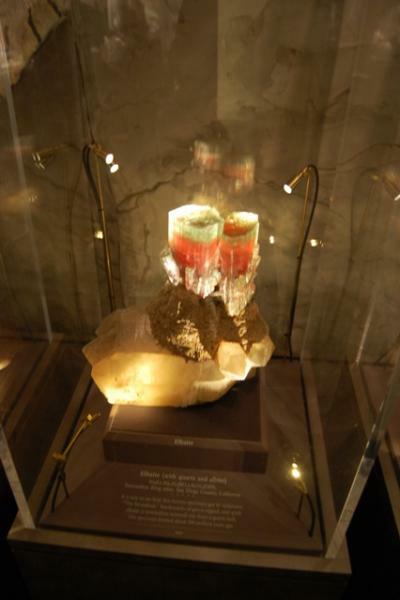 Eye-catching group of three incredible tourmaline specimens - so beautiful, and impossible to miss! 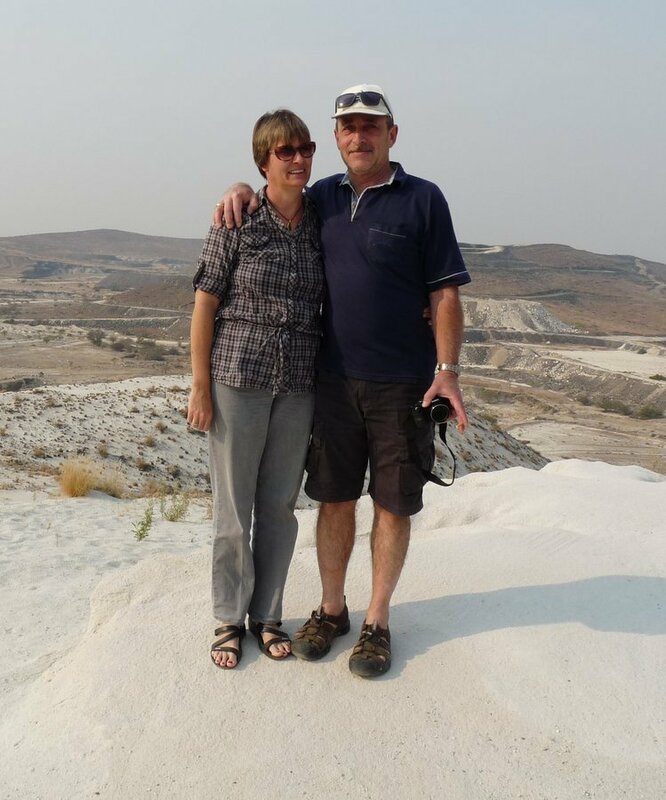 Lovely post Tracy, thanks to share it with us! 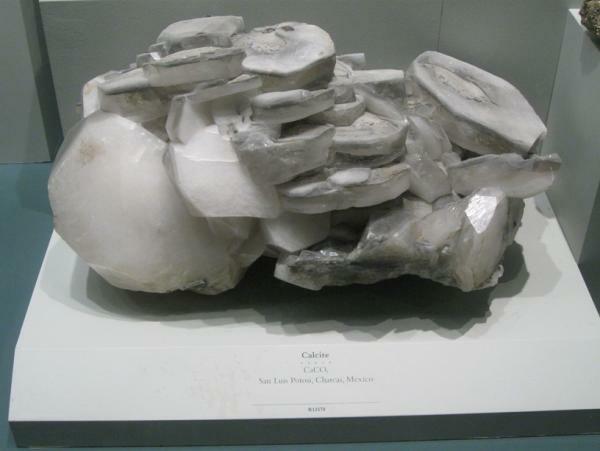 Jon: yes, the sandstone concretion is from France. 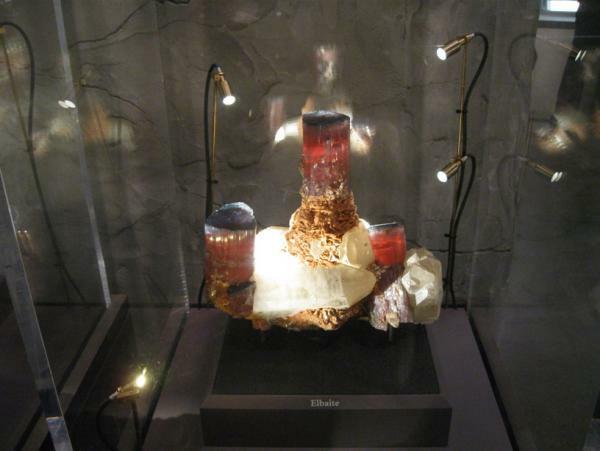 French people name it "Gogottes" and they are found in Fontainebleau forest, close Paris. 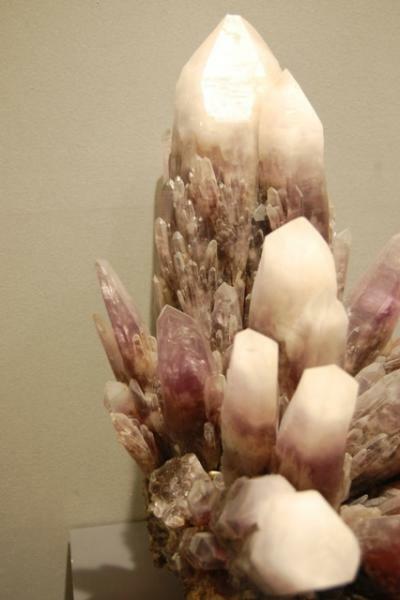 Finally found my photos from the Smithsonian and here is that incredible Amethyst Quartz I had talked about. Wow! 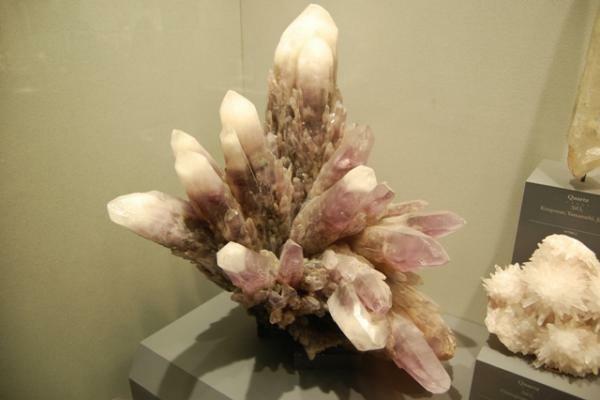 More shots of the Mexican Amethyst Quartz from Amatitlan, Guerrero. This is featured in Paul Desautels book in 1968. 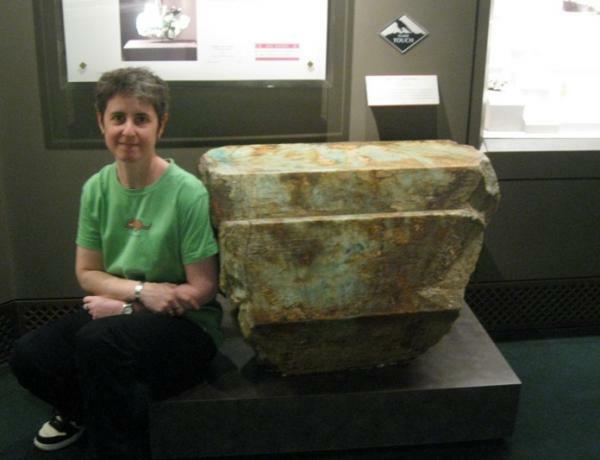 I was awestruck when I saw this piece. This gives you a slight idea of the over 60cm tall specimen. Collected by the Ontiveros family in the 1960's. 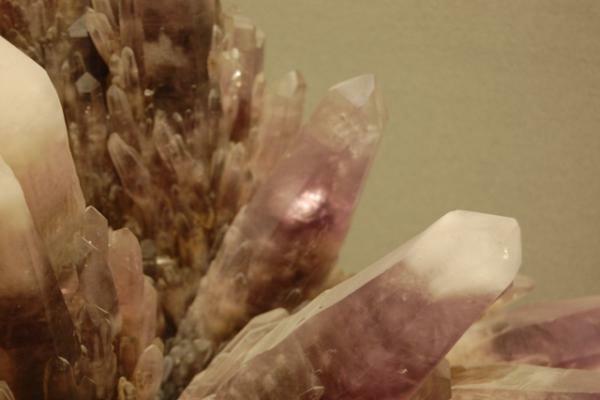 close up of some crystals. This is a massive sized spray, quite breathtaking! 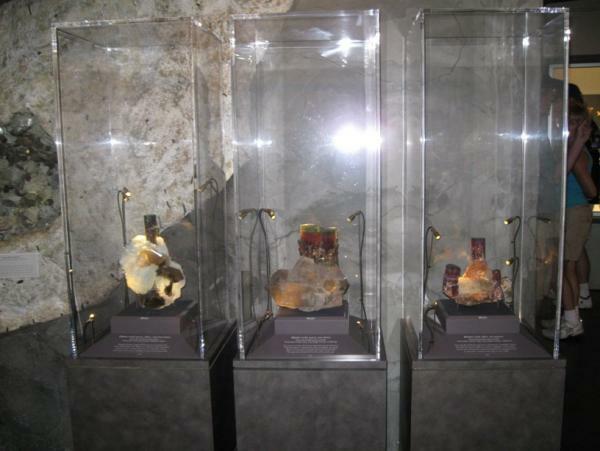 Some photos of various display cabinets. I took these photos through the glass, so bear with me please? 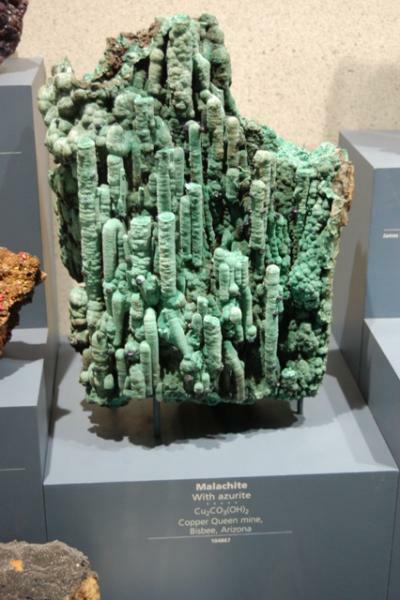 One of the many beautiful displays at the Smithsonian mineral hall. 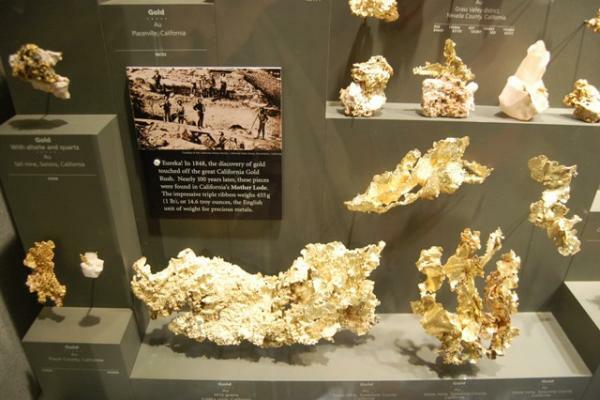 Gold display Cabinet and close ups. I did my best to photograph these through the glass. 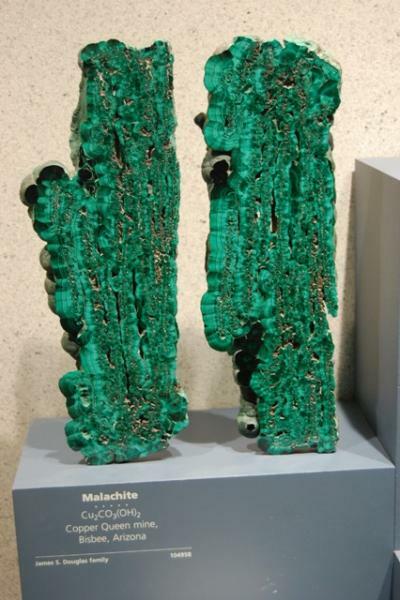 A couple of the beautiful "Blue Cap" Tourmalines on display. Various rough and cut displays. 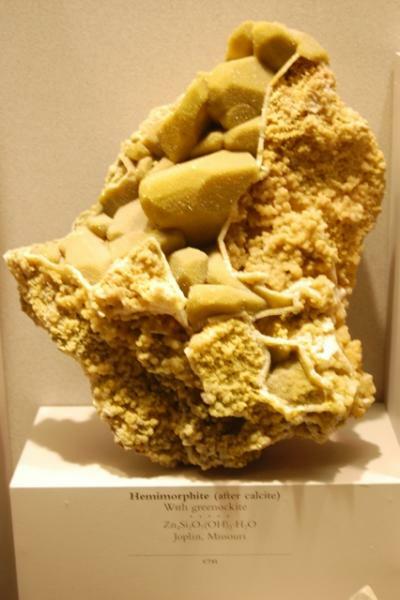 Hemimorphite ( after calcite ) . They put a bench across from this display so you can sit and LOOK at it! 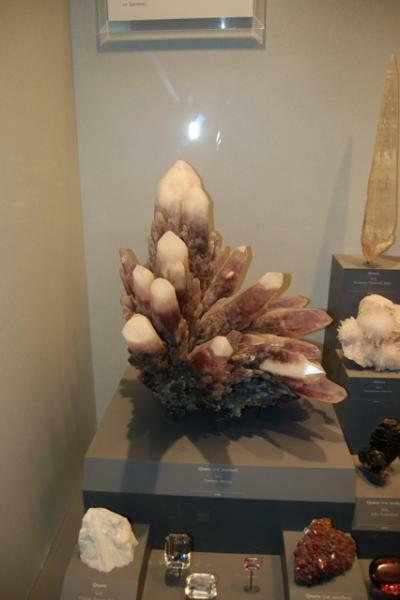 In the 1960's, there is an article in Lapidary Journal, probably more of a news update, that chronicles the journey of this amethyst from Amatitlan via many miles on a burro to the Smithsonian. I do not have the date of the issue, I just remember reading about it and I believe there is a picture of the piece as well. I will have to look that up Les. I love to hear the stories. I know our piece was left to the pilot of the fellow who first took ownership and eventually, after the pilot's death, was inherited by a family member. We heard, for what it is worth, that it sat in a closet for many years and it came to us when the owner needed to barter for some jewelry cabinets. Not sure if you saw it when we picked it up in Denver, or at our home, but it is absolutely beautiful and here is a photo of it. 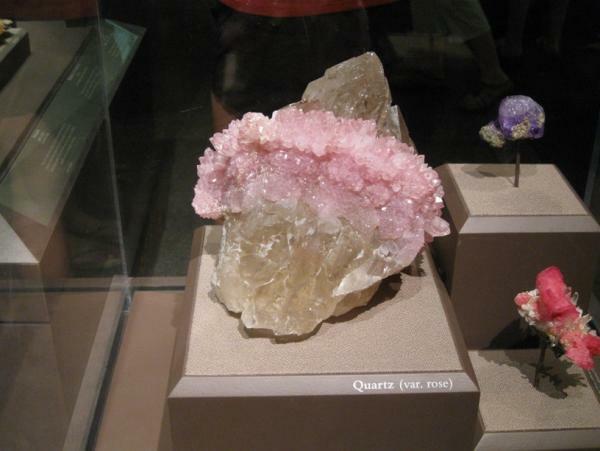 It pales in size, but it does have hold its own in gemminess and colour. This is in the Spann collection. 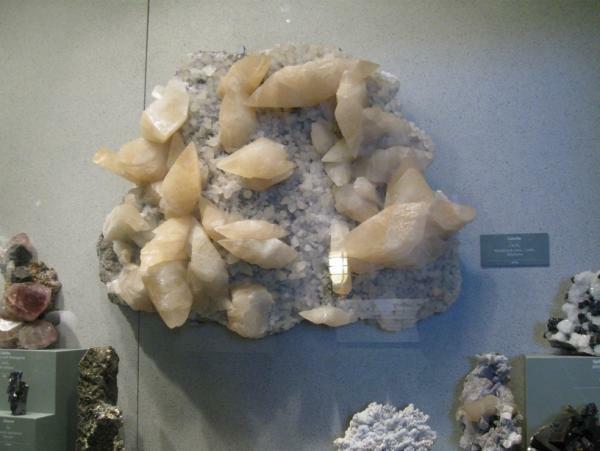 Jordi, thanks for letting us know that the sandstone concretions are called "Gogottes." They are fascinating. 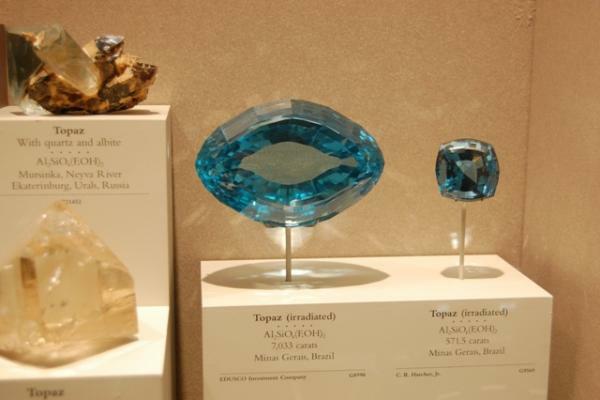 A pity that most people don't notice the one at the museum because they go straight over to look at the Hope diamond...are they easy to obtain (in smaller sizes, of course)? Last, thank you Jordi and Jon for your kind words! 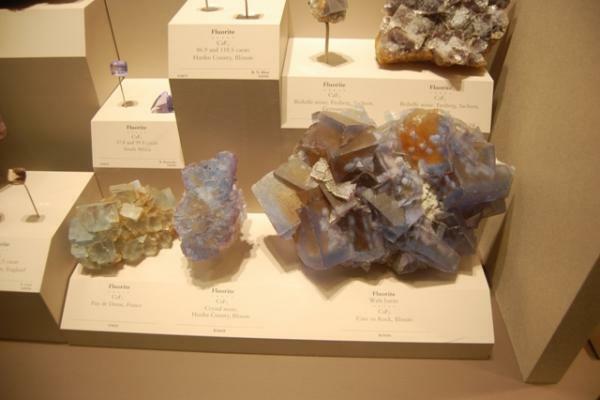 This is a very large, geometrically complex, superbly colored fluorite cluster from Cave-in Rock. 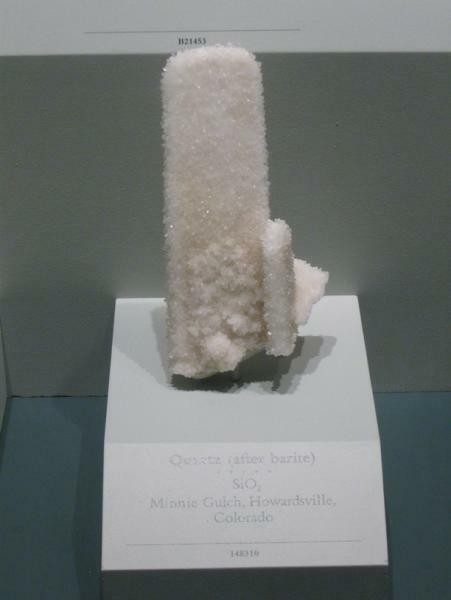 Quartz after Baryte. I found this specimen to be incredibly elegant. 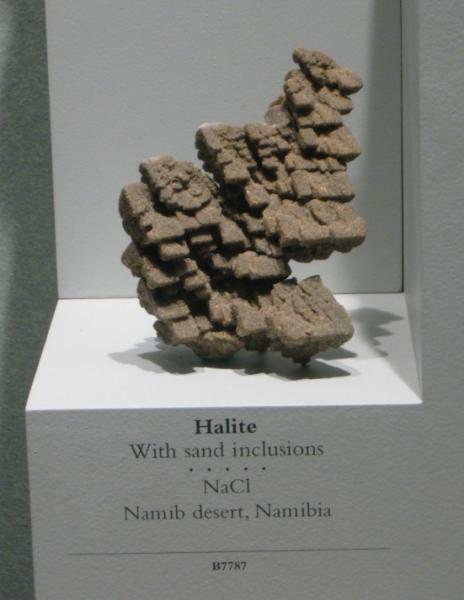 Halite included with sand. Very sculptural.